Although this is traditionally the holiday season, it is important to keep on top of some of the routine garden jobs, such as deadheading, weeding and watering. This could be a dry month in which case watering is essential (especially any indoor plants), remember to ask a neighbour or friend to call in if you are going away. Water plants that need it regularly. The basics apply here: water wisely and thoroughly especially if your shrubs or trees are newly planted. Weed around the base of plants on a dry day, preferably using a dutch hoe which will cut the tops of the weed off and leave them to wither and compost back down into the soil. Trim hedges. Most hedge plants will need their last trim before the colder seasons set in. Conifer hedges may be the exception to this because they continue to grow until October and can have a final going-over then. To get a level top to your hedge bash in two posts at either end of the hedge and tie some twine between the two at the height that you are trying to achieve. Tackle the sides of the hedge first and start at the bottom so that you can see more clearly how much you have taken off as the cuttings fall to the ground and do not get caught on foliage below. The aim is to “batter” the hedge which means to leave the hedge wider at the base than at the top so that it can withstand winter weather better. Once you are happy with the sides of the hedge, trim the top last using the twine as your guide. Conifer hedges need to be maintained within the limits of the height and width you prefer for them because they, yew being the notable exception, will not grow from old wood. And if your hedge is composed of a large leaved plant like laurel, for aesthetic’s sake you are best to prune it with secateurs so that you trim off whole leaves rather than use an electric shearer which will cut through half a leaf leaving the remainder to brown on the hedge. To prevent box blight – which is becoming more of a menace it is worth considering leaving your box balls and hedges a little looser and even removing some of the internal branches so that more air can circulate through and around the plant to prevent the fungus spores of the blight from settling. Another preventative measure is to try to ensure that your box has no other plants growing closer than 50 cm for the same reason. You are also less likely to get blight if you prune your box in winter when the disease is dormant. Camellias and rhododendrons start producing flowering buds now, so during dry spells need regular and thorough watering. Prune rambling roses after flowering. The rule is that ramblers flower on last year’s wood so there are two stages to dealing with ramblers. First you need to cut out much older wood to the ground to encourage new growth and cut sideshoots that have flowered back to 2-3 buds from the main stem. Second, any new wood should be tied in ready to flower the following year. Wild roses should be left as they are in the hopes that their spent flowers will produce beautiful hips in the autumn. As with July, your roses will require dead heading down to a good, outward facing bud at least one or two leaves below the flowered stem. The emphasis should be on finding a strong bud to increase your chances of another flower forming, but remember that the harder you prune the more vigorously the rose will respond with a strong shoot. Feed and water if the dead-heading evolves into a pruning session and you cut back many flowered stems. Trim lavender – When the flowers are beginning to dry out on the plant and you have harvested enough to flavour sugar, or scatter in your bath of an evening, trim all the flowered spikes back and take about 2.5 cm of the leafy growth at the tips of shoots at the same time to prevent your lavender bushes from becoming leggy and mis-shapen. If your lavender has become twiggy and straggly because lavender rarely grows from old wood, your best bet may well be to take cuttings of your old plants or to buy in some new plants to replace the old ones. Lavender does thrives in a free draining soil so if you are gardening on a heavy, clay soil make sure that you add plenty of grit to the soil to improve drainage. Feed and water all plants in containers. Any shrubs kept in pots should be well watered and fed at least weekly. Woody shrubs require a high potash fertiliser to encourage any wood to ripen rather than remain soft and sappy and delicious for pests or easy to damage in winter. Olive and bay – Feed once a month and water regularly so that the soil never dries out. Apply nematodes for vine weevil control. Target vulnerable plants, especially those grown in pots. Rosemary beetle, both adults and larvae, feed in late summer. Remove them by hand to prevent damage to rosemary, lavendar and sage. Take cuttings from tender perennials such as pelargoniums and fuchsias. Take cuttings from Penstemons now, as replacement plants for those that may be lost over winter. Use non-flowering shoot-tip growth and keep cuttings frost-free until spring. 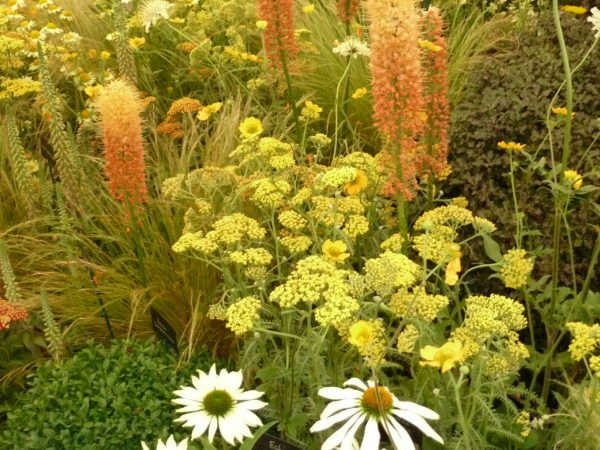 Cut back perennials, especially ones like Achilleas which have a tendency to collapse and smother plants around them. Late flowering perennials like asters and rudbeckias are worth staking. Geraniums that are now over should be cut down, watered and fed in the hopes that they may return with a vengeance for an autumn show. Collect ripening seed from plants you wish to propagate,for example poppies, hardy geraniums and nigella. Store in labelled paper bags in an air tight container for sowing next spring. Mow less frequently if the weather is hot and dry. Lift and dry onions (spring-sown or planted onions and shallots) once their foliage yellows and topples over. Dry bulbs in full sun for two weeks before storing in a cool, dry place. Cut and dry herbs for winter use. Dry in a warm room or oven, for crumbling into labelled, sealed jars, or freeze in plastic bags or ice-cube trays, for supply during winter. Prop up heavily laden branches of fruit trees. Summer-prune gooseberries and red currants. Water and feed tomatoes regularly, and remove yellow leaves. Cordon tomatoes should be stopped once they set four trusses, if outdoors, or six trusses if under glass. Remove the tip of the main stem two leaves above the uppermost truss. Unless it is very dry, August is a good time to plant new strawberry plants so that they can build up some ballast before winter. Keep watering them once you have planted. If there is a serious shortage of water or you are going to be away, put this job off until September. Where you have old strawberry plants that are virus free (the virus can be detected by streaky, rather than plain green foliage) you can use some of their runner or plantlets as new plants. Always plant strawberry plants on ground where there have not been strawberries grown recently. Anyone who really loves their strawberries might want to try potting up some plantlets in pots so that they can be forced for early fruit next summer. Use an 18 cm pot and leave them outside for the rest of the summer. In autumn, put the pots on their side so that they do not become too wet and early in the new year take the pots inside into a greenhouse so that they start to produce fruit early on in spring. Harvest the first apples and pears. Last chance to; finish summer pruning apples and pears and other trained fruit trees as espaliers and fans by the end of this month. Shorten lateral stems to three leaves above the basal cluster. Complete summer pruning of wisteria. The whippy growth that your wisteria will have produced should be cut back so that they are within five or six buds from the main stem or use that same whippy growth to tie in to extend the framework of the wisteria if it is a young specimen. Where a wisteria does not flower may be down to an incorrect pruning regimen but often it is because the wisteria is not a named variety that has been grafted on to vigorous rootstock. To check that your wisteria has been grafted look for a slightly swollen area at the base of the main stem. Without this assurance your wisteria may take many years to flower, or never do so, so it is worth investing in a named variety from a reputable supplier. Unbelievably it is time to start thinking about daffodils for next year. Ideally daffodils and narcissi should be planted by the end of October at the latest in random drifts in grass so that they can naturalise and spread over the years. For anyone gardening on a smaller scale there are many miniature varieties that look good in raised beds or pots or rockeries. A good tip, but a hard one to carry out!, is to mark any bulbs that you put into borders to prevent you digging them up when their foliage has died down as you weed and plant over the rest of the year. Plant the bulbs two to three times their own depth and add a little bonemeal to the planting hole. 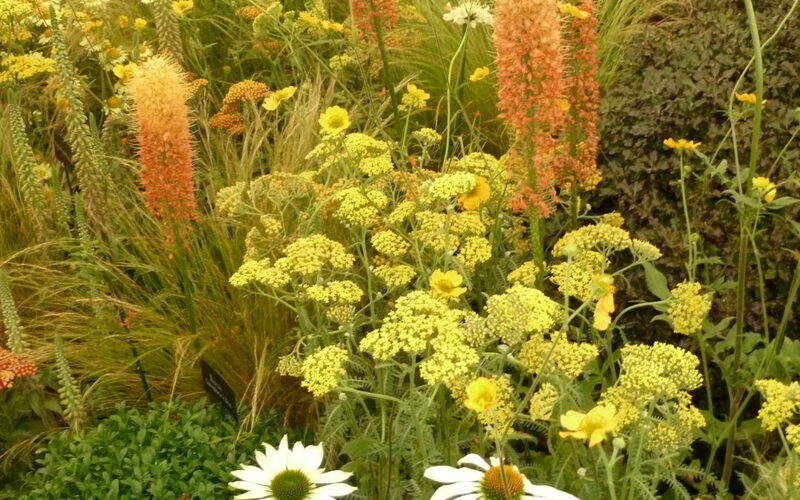 If you are gardening on heavy clay soil sprinkle some grit at the bottom of the planting hole as well. Colchicums can also be planted during August. They look best surrounded by grass or other plants since their flowers arrive before their leaves and they can appear quite naked otherwise. Having got over the shock of planning for next spring it is worth turning to Christmas because now is the time to order prepared hyacinth and some narcissi bulbs and pot them up so that they will be ready for December. Ordinary potting compost is a perfectly acceptable planting medium unless you are planting the bulbs in a decorative pot that has no drainage holes in which case use bulb fibre. Place several bulbs in your pot on a layer of compost so that they are almost touching. Then cover the bulbs so that only the very tip of the bulb is poking above the soil. Put the pots into a cool, dark place and after about 6 weeks inspect them daily for growth. Once you can see about an inch of shoot then bring the pots in to reasonably cool but light conditions. During a hot spell, splash water on the floor of your greenhouse to keep the atmosphere humid and to cool proceedings. Leave the doors and ventilators open during the day. Your vegetable garden should be in full swing. It may be hard to motivate yourself to keep sowing seeds when you are facing a glut of courgettes, amongst others, but you will thank yourself if you can summon up the energy to sow some rows of chard, kale and winter lettuces like Salad Bowl or Merveille de Quatre Saisons to keep you going into the winter. Leave out some blocks of wood or up turned pots for slugs to shelter in overnight and then turn them over in the morning to give the birds a slug feast or, for the less squeamish, dispose of them at will. A wellington boot heel usually does it! Raise the blades on your lawn mower if the weather is hot and dry; you may find that you don’t have to mow quite so frequently too. However for established lawns it is unnecessary to water them because the grass will recover once the rain does come again. Towards the end of the month use a high phosphate fertiliser to benefit the roots of the grass to survive the rigours of the winter ahead. If you are planning a new area of lawn it is worth starting to prepare the ground now. The wet and warm of autumn is the most user-friendly time to try to establish a new lawn because it will need lots of water and you have the advantage of autumn dew and warm soil providing optimal conditions for grass seed to germinate or turf to establish. Dig through the area to turf and remove any weeds now and then in the fallow period before sowing any perennial weeds will have the opportunity to grow again. At which point you can nobble them with a spray of glyphosate before laying the turf or seeding. If you have house martins nearby, leaving out a dish of moistened mud helps them build or repair nests for their second, even third, brood. Consider sowing yellow rattle (Rhinanthus minor) if grasses have taken over in a perennial wildflower meadow, as it is semi-parasitic on grasses. Sow after the main summer cut and keep grass mown until March. When deadheading, leave some flowerheads to run to seed as a food for birds and small mammals.